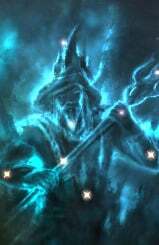 Blessed is a star within the Constellation The Apprentice in Elder Scrolls Online. This was added in Update 6 with the Champion System. It increases the effectiveness by any healing you initiate by [x]%. You can put 100 Champion Points into this passive ability for a maximum of 15%. With each point invested, the increase in the effectiveness of any healing you initiate diminishes. That is to say, for the first 10 CP invested, you would gain a 2.9% increase in the Effectiveness. However, the next 10 CP spent (making a total of 20 CP spent), will earn you only 2.56% more Effectiveness. This is 0.34% less than the increase gained in the first 10 CP. As such, spending just 37 CP into Blessed will already gain you a 9.09% increase in the effectiveness of any healing you initiate. This means you will have gained 60% of the Maximum increase possible (which is 15.0%) by spending just 37 out of the total of 100 CP. Therefore, beyond this point, the increase in Effectiveness received per 1 CP used is very small and not as worthwhile.